You don’t need to be a nerd to spot the lowest common denominator between comic book characters like Iron Man, Batman, Cannonball, Gambit, The Thing, and, of course, the Joker. But, that said, it certainly makes your life a lot easier if you are! These characters are larger than life, and many of them sport their own Hollywood blockbusters. Believe it or not, one of the X-Men, Cannonball, is a die-hard fan of Texas Hold’em poker. He has been spotted competing for high stakes in grueling poker tournaments arranged by other heroes and villains. He’s an ace fighter, plus he’s always holding the trump card in his fist of five. What’s great about Cannonball is that he pretends to not know much about the game, while he lures his opponents deeper and deeper into the contest. Then, he strikes with unbelievable poker hands and massive cash hauls. He’s a gentleman by nature, having been raised in a traditional southern home. Yet he’s also got plenty of tricks in his pockets, and we wouldn’t be surprised if he’s holding pocket rockets up his sleeve. 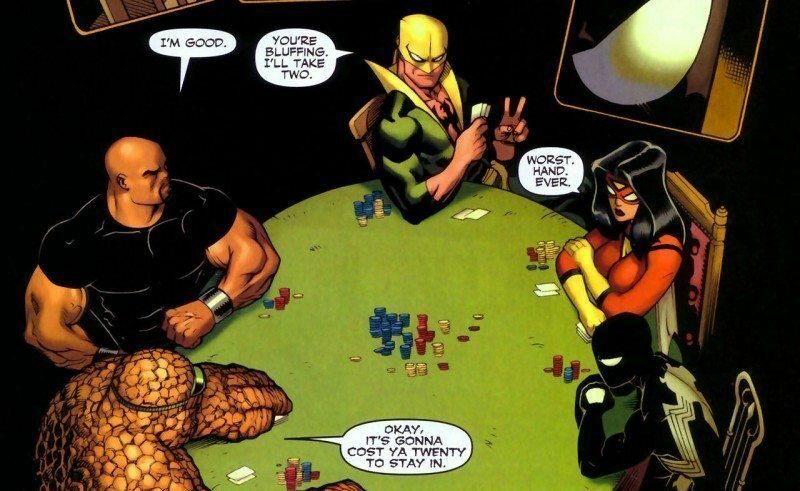 Poker has always featured as one of the most revered gambling-style games for the creators of superheroes. Cannonball is a great exponent of the modern game, and his guile and wit serves him well in contests. What about the Joker of Poker? Batman and the Joker appear to be unevenly matched rivals, despite being formidable foes in every sense of the word. It may not be common knowledge, but both Batman and the Joker are poker players. Bruce Wayne -- billionaire by day, Batman by night -- is never one to back away from a challenge. When his financial pedigree is questioned, he is willing to wager big to safeguard the dignity and honor of the Wayne name. While the two characters may not always be seen playing poker games, their behavior and their interaction with one another is poker’esque! It’s always a game of one-upmanship between the Joker and Batman, with no real clarity in their ‘deranged’ psychological games. Batman has learned to read people’s faces -- their poker faces -- through his many dealings with the scum of the earth. That he keeps a poker face in the heat of the moment is a testament to his iron will. Can The Thing Play Poker? Don’t let the fact that he is made of rocks confuse you; Ben Grimm (a.k.a. The Thing) is no slouch in poker. 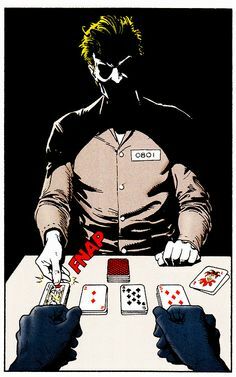 As you can see from the picture provided, and many editions of The Fantastic Four, The Thing is a poker ace. 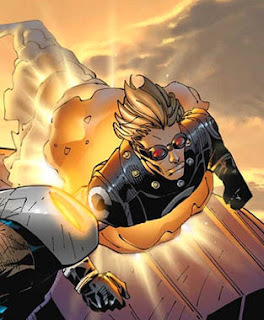 He is a scientist first and foremost, and his analytical mind is perfectly adapted to organizing poker tournaments for other Marvel universe heroes. I mean, did you know that The Thing celebrated his bar mitzvah anniversary with a poker tournament? He’s the guy we love to hate because he’s so arrogant and pompous at all times. But he’s a genius and he’s a hero and we wouldn’t have it any other way. Tony Stark (a.k.a. Iron Man) is a gambler through and through. He bets big, he keeps a poker face, and he’s supremely confident at all times. So don’t be surprised if you run into this guy at one of the finest Las Vegas casinos and poker rooms like the Bellagio or Caesar’s Palace! Back in 2008, Tony Stark was late for an award ceremony of his, because he was playing poker! So What Does It Take to Be a Superhero of Poker? Poker is an easy game to learn, but a difficult game to master. Ask one of the X-Men, namely Gambit, all about poker and he will tell you. This Marvel character is often seen with a deck of playing cards. He may not be the world’s premier poker champion, but he knows that you should always approach fellow poker players with respect, awareness, and reservation. 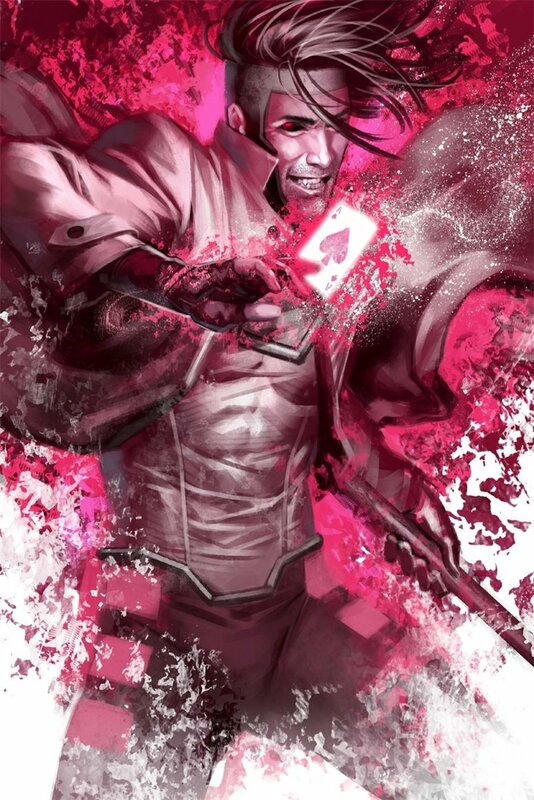 It has been said that Gambit would probably be one of the better performers in a Marvel poker series. Fortunately, good poker players can be molded with the right mix of determination, skill, and natural ability. If you’re looking to become a poker superhero, it is a good idea to start with the basics. Work hard, play hard, and bridge the gap between amateur and professional. Hold your head up high and keep your poker face in place at all times!